SFMOMA was founded in 1935 as the first West Coast museum devoted to modern and contemporary art. Today, it stands as an icon of San Francisco, expanding seven floors of gallery space featuring outstanding holdings of more than 33,000 modern and contemporary artworks and rotating exhibitions on view. Come visit the museum that the New York Times described as “changing the face of museums going forward.” After a 3-year closure, the San Francisco Museum of Modern Art (SFMOMA) is once again open with a breathtaking new expansion. Seamlessly integrating the original museum with a new 10-story building designed by international architects Snohetta, SFMOMA now expands, featuring outstanding holdings of more than 33,000 modern and contemporary artworks of painting, sculpture, photography, architecture, design, and media arts. Make the most of your visit with SFMOMA’s immersive iOS app, including hundreds of 60-90 second audio reflections and responses to artworks in the galleries by composers, comedians, artists, and playwrights, among others. Audio guides are also available to rent at SFMOMA for a fee. Please note free public tours and spotlight talks are offered daily onsite. 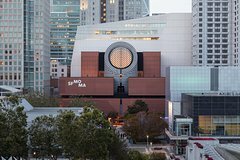 Information regarding unique private guided tour experiences and rotating exhibitions can be found on SFMOMA’s website. SFMOMA is appropriate for visitors of all ages and all guests 18 and younger are free. With six city-view terraces, a new sculptural staircase and Roman steps where the public can gather, a variety of dining options, and a museum store offering artful gift options for everyone, SFMOMA is an unforgettable experience and a must-see San Francisco destination.